I intended to crank out three DIPA batches leading up to the XOXO conference in Portland this September, then bring the best of the bunch down with me. Time and fermentor space being what they are, I only just managed to squeeze in this second batch. Two things I wanted to tweak with this batch: one, it needed to be dry. At least 5 points drier than the last one. I aimed for a 1.012 or lower finish. And two: I wanted to change the hop proportions a bit to tone down the fruit and find a better flavour balance. Less Simcoe, more Centennial. I inherited a bit of gear from a local club member who passed away recently (RIP, David), including an already-built heat stick. I had to add a grounded plug to get it operational, and wasn’t sure I’d use it on this brew, but as soon as I plugged it in and got the HLT water ramped up to strike temps in record time, it was pretty obvious I’d be using it from now on to cut down heating time on my brew day. The mash looked like it was going well; a bit high for my target, sitting at 150.5F most of the time, but close enough that I wasn’t worried. At 60 minutes I was getting noticeably starchy flavour, and my iodine tests were failing. I gave it another 15m, but still wasn’t getting full conversion, so I dropped in the heat stick and stirred slowly to prevent scorching until I raised my temperatures closer to 170F. My thought was that more alpha-amylase action would help clean it up, and after 15 more minutes it was finally finished. The boil was the most vigorous I’ve ever managed thanks to the heat stick. 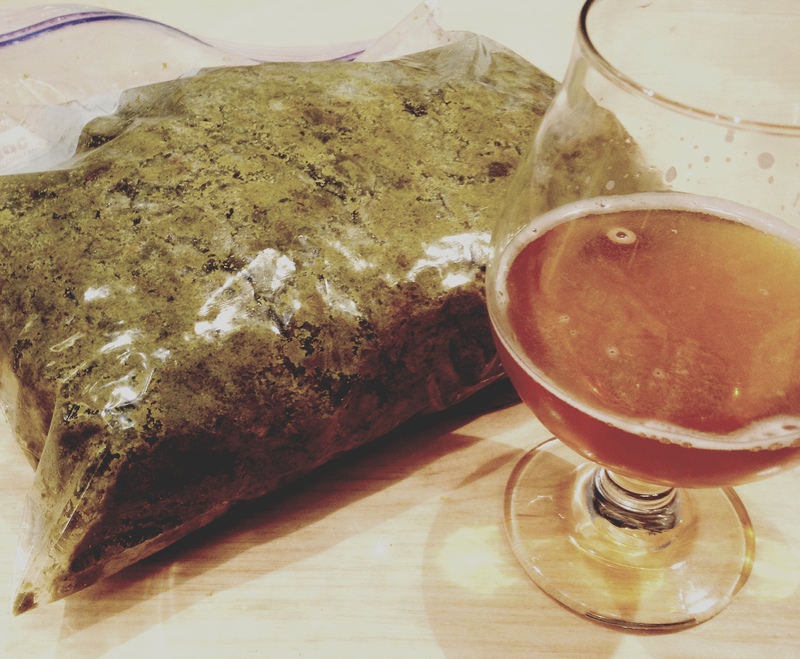 But now I have a new problem of trying to keep a bag full of hops — a must, thanks to the Therminator — away from the heating element during the boil; I’m looking into better hop blocking solutions for future brews. Fermentation posed the second problem. 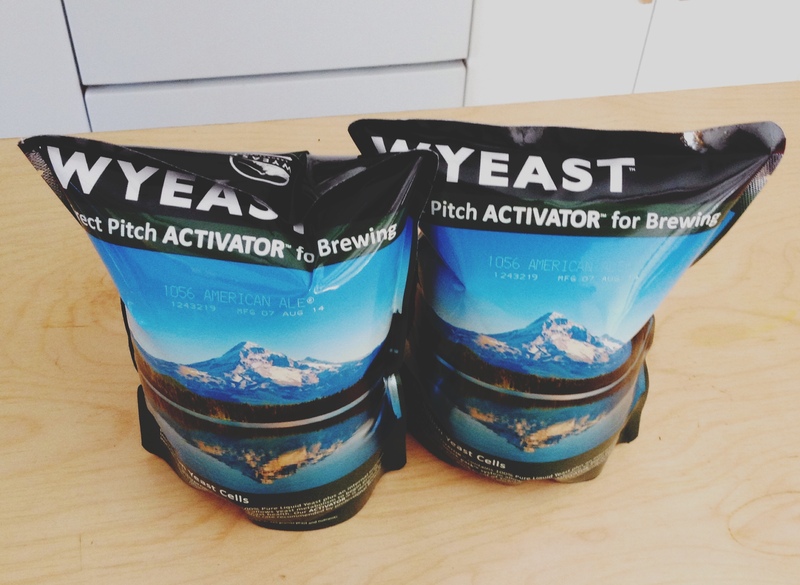 I held onto the WLP007 yeast cake from my most recent brew with the intention of re-pitching. I boiled down a half volume starter before the brew day and let it sit on the stir plate throughout, pitching about 8hrs later. I had a feeling there was something not quite right due to the lack of activity over that time, but I thought it might respond better to higher gravity wort and went with it. After the first day, there was no activity. A long lag time for a re-pitch, but I figured it should kick off in another day. But the next morning there was still nothing. So I made an emergency trip out to the local homebrew shop and picked up a pair of 1056 smack packs, got them going at lunch and pitched right after work. 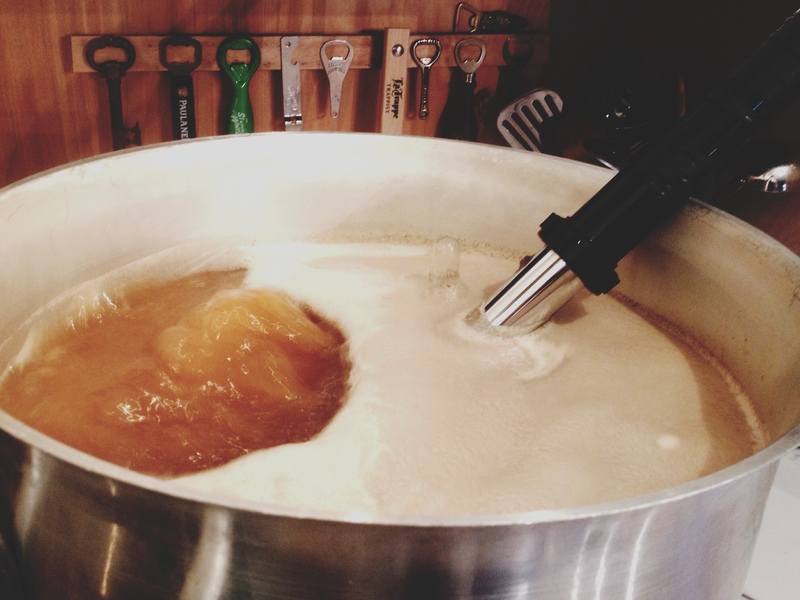 6 hours later there was a thin white krausen, and the next day it had developed into a huge foamy white head. So, going in, there were a few problems that could have derailed this batch. But in both cases I was able to formulate backup plans and salvage the brew day. I hope. It’s possible this will end up a bit on the sour side, but my sanitation has proven fairly strong so I’m not worried. 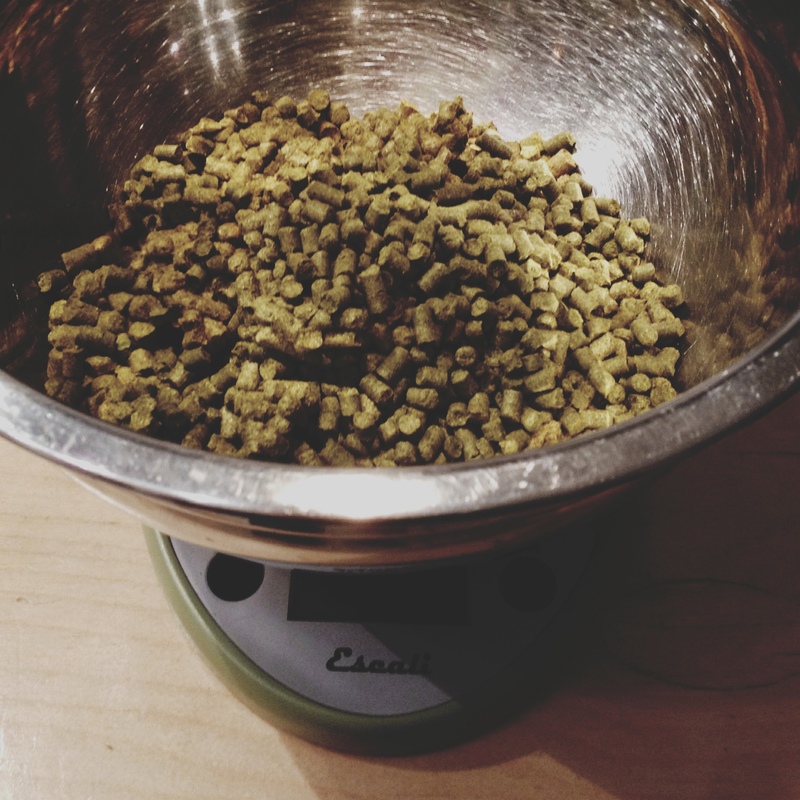 Boil hops pulled out from this batch of DIPA, destined for the compost. Shown alongside pour of the previous batch of DIPA. After two weeks the krausen had dropped and the refractometer was showing it as somewhere in the 1.006-1.010 range, which was good enough to cold crash for a few days. Kegged at 16 days, drinking shortly after. The first few pours alternated from rich, almost sweet hops (must be the hops, at that low finish) to great aroma, but bitter and finishing harsh. After a week in the keg (and after many samples blended off the tap) I made the call to blend it with the remnants of #043, about 1/3 that batch and 2/3rds this batch. The aroma on the unblended batch was nothing short of everything I want from a DIPA. The taste… well, that left a lot to be desired — started great, middle was fine, but ended too harsh to be enjoyable. Though the blend will dull down some of that killer aroma, and extra sweetness from the other batch will affect the balance, I’m hoping for a more drinkable beer over all. I’m at a bit of a loss over the harsh finish. I can see a few possibilities: the lag time before the yeast went active, a heavier-than-normal dosage of gypsum, or some scorching from the heat stick when stirring the mash. I’ll be brewing with the heat stick again in the near future and hopefully eliminate that last one as the cause at least. This batch only gets a 5/10. The result of the blend is piney, pineapple, a bit of citrus candy and just slightly too sweet tasting. Not a bad result, and more drinkable than each batch on its own. 6/10 for that one.